Whether your workout of choice is running, weightlifting, cycling, dancing or something else, almost every form of movement can be classified as either cardiovascular or strength training and when it comes to staying fit and healthy, exercisers usually gravitate to one or the other. But lately the debate has surpassed mere preference as some fitness experts have gone so far as to renounce cardio altogether. Can you achieve the body you want without cardio? Whether cardio or strength training is better — or one can exist without the other — all depends on your individual goals and what you want to achieve. Are you looking to burn fat, relieve stress, or increase your speed? We’ll discuss six goals and decide which mode of exercise, strength training or cardio, is the most appropriate for that goal. For strictly torching calories, cardio burns more calories per minute than strength training, but the benefit of lifting weights lies in the metabolic spike it provides for up to an hour after your workout while your muscles recover. Moreover, muscle boosts overall metabolism because it uses more energy. So the more muscle you have, the higher your Resting Energy Expenditure (REE), an indicator of how many calories you’ll burn in a given day while at rest. If you’re looking to drop weight, make strength training the focus of two out of three workouts each week. You can end an hour-long workout with five to ten minutes of cardio. Or, instead of long, drawn-out, low intensity cardio sessions, keep things interesting and moving at a faster pace with high intensity interval training, alternating between different efforts and speeds. Interval training burns calories more efficiently than a typical cardio workout keeping the body burning calories for hours after the workout is over. One study even claimed that interval training can burn up to three times the amount of fat in half the typical exercise time. Cardio boosts serotonin levels in the brain, which can counteract depression, clear the mind and reduce fatigue – a benefit pumping iron just can’t offer. A study in the Journal of Psychophysiology found that aerobic exercise reduced the heart rate and lowered blood pressure in response to psychological stressors more so than strength training could. If you’re feeling stressed, you will start to feel the stress-reducing effects with as little as fifteen minutes of cardiovascular exercise two to three times per week. Cardio can put tremendous strain on muscles, joints and tendons, which over time, can result in injury. To stay injury-free, it’s imperative to complement cardio with strength training. In particular, functional strength training consisting of moves that promote balance and core strength is one of the best ways to reduce the risk of injury. Both cardio and strength training can help improve self-image. Cardiovascular training gives endurance athletes a sense of accomplishment, according to sports psychologists. While strength training can offer a similar benefit as weight and reps increase over time. However, strength training can also help re-shape the body. Cardiovascular workouts result in weight loss, a combination of fat and muscle, but weight training promotes fat loss while enhancing the body’s natural curves. While strength training can help reduce intra-abdominal fat, a major risk factor for heart disease, the real anti-aging and health promoting benefits come from cardiovascular exercise, which has been proven to reduce the risk of obesity, heart disease, diabetes, osteoporosis, high blood pressure and cancer. With aging comes the loss of muscle mass, and decreased heart and body size. Regular exercise can help slow or even reverse this process by encouraging lean muscle mass, improving mobility and reducing the chance of heart attack by 50 percent. Want to race faster? You need a mix of cardio and strength. Practicing speed and efficiency in your sport will increase endurance while strength training with core work and plyometrics are important for increasing power. Does all of this mean that all strength training programs and all cardio programs will work equally? Not exactly. To get the most benefit out of your strength training routine, use compound movements that use multiple, larger muscle groups. This will not only save time by working more muscles in less time, but it will also give you better strength gains than performing isolated exercises. While doing cardio, get in the habit of doing short bursts of high intensities. The higher intensities will burn more fat in significantly less time. What science has taught us is that steady-state cardio workouts of an hour or longer are no longer necessary to reap the benefits of a cardiovascular workout. The same health benefits can be had in half that time or even less. Focus on quality, not quantity for the best results. It’s clear that both cardio and strength serve very different purposes, but for a well-rounded workout plan that gives you all the health benefits mentioned above, you should incorporate both. 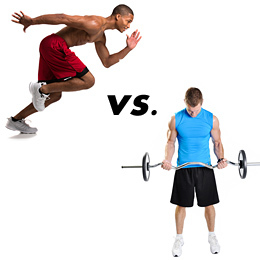 What do you think about the cardio versus strength training debate? Let us know in the comments below! Brian Maher is a personal trainer in Center City Philadelphia who specializes in weight loss and nutritional counseling. He is the owner of Philly Personal Training, a company offering convenient personal training packages to busy individuals looking to improve their fitness levels. For more information, visit his website at www.phillypersonaltraining.com.